As I’ve written before, the FCC’s claim that rolling back Net Neutrality will result in more competition (which presumably will be better for consumers) is flawed because of the cost of the last mile. What that means, in summary, is that over the last 30 years various cable and telecom companies have bared the cost of laying all the cable/wire necessary to bring internet service to most of the homes and businesses in US cities. They did this because city governments were more than willing to trade the enormous cost of creating a citywide network for the provider having (in most cases) an effective monopoly on providing internet access. This isn’t the first time a service or utility has evolved in this manner in the United States. The railroads, the telegraph and later telephone service were all networks that were developed in much the same way. In 1963 a man named John Goeken was running a small company called Microwave Communications Incorporated when he applied for a license to set up radio repeaters between Chicago and St. Louis with the hopes of selling more radios to truckers. When his application was declined, he discovered that AT&T had a monopoly on such communications. He filed a lawsuit which eventually led to the breakup of the Bell System and the requirement that AT&T sell access to its network to other long distance providers such as Goeken’s company which became better know by its acronym, MCI. Since then long distance prices have dropped dramatically (effectively to zero for most people) and innovation increased substantially as well. In our history lies the solution. The FCC should require cable and telecom companies to sell access to their networks to other companies that wish to provide internet access. That would potentially create significant competition (the FCC’s stated primary concern) which would drive down prices and drive up innovation just as we saw when that requirement was mandated to AT&T. Some states are beginning to pass their own Net Neutrality laws. That’s not a bad idea but what I’m suggesting is a better one, one that applies to the country as a whole and has a clear and successful historical precedent. Treat them like utilities and break up the monopolies. 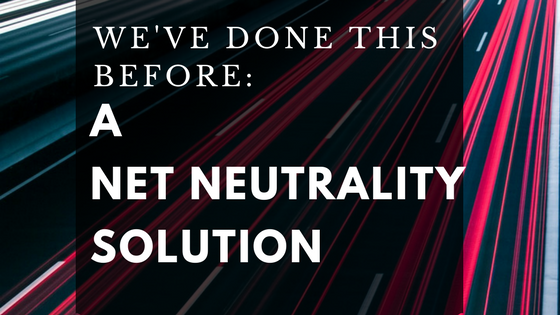 It’s what should have been done in the first place in addition to Net Neutrality. AT&T recently suggested that Congress should pass what they called an “Internet Bill of Rights”. While I applaud AT&T’s position, I’m also suspicious of it. Having the problem solved by Congress makes it easy for AT&T to concentrate its lobbying efforts in one place and thus having influence over the ultimate solution. As we say here in Texas, this is not our first rodeo. We know the right solution because we’ve applied it before with great success. We now just need our legislators to have the political fortitude to do the right thing.